Here we are with our first Easter special: a complete melodic transcription of the 10th movement of J.S. Bach's cantata BWV 147. 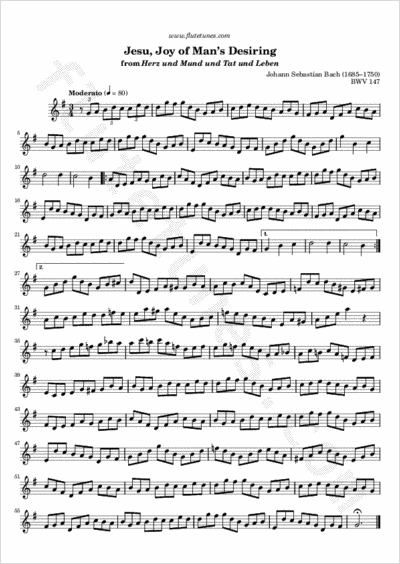 Today, this is often performed at wedding ceremonies slowly and reverently, in defiance of the effect suggested by Bach in his original scoring, for voices with trumpet, oboes, strings and continuo. Written during his first year in Leipzig, this chorale movement is one of Bach's most enduring works. Just a word about rhythm. We've kept the original 3/4 time signature, but as you might notice the main melody line which we have isolated in our transcription is actually in 9/8 time. Of course, this poses no problem since most of the piece is just a sequence of notes of equal duration.